Ducks are waterfowl and it is important for them to have access to water so that they can swim in the water as well as dabble in it, submerge their head in it to keep their eyes clean and healthy and to bathe in it so that they can keep themselves free from mites and lice. Some duck breeds need a larger pond than others. I have khaki campbell ducks and they are happy to dabble and bathe in containers of water. 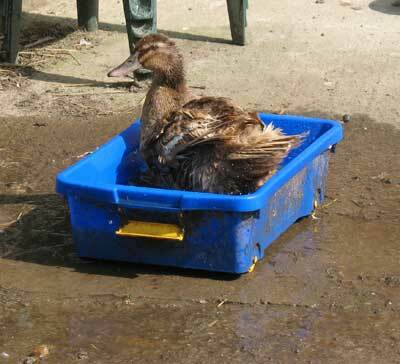 If you don’t have a pond then you can provide your ducks with large containers so that they can still dabble, bathe and swim if the container is large enough. There are many reasons why ducks may stop laying eggs or may not lay eggs. 1. The age of the duck – as they get older the amount of eggs may reduce. 2. 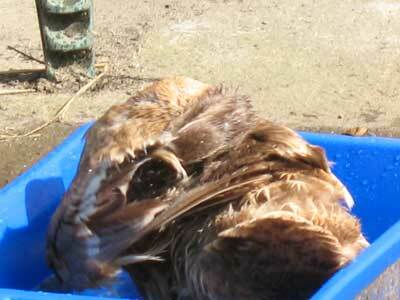 The health of the duck – illness or parasites can hinder laying. 3. The time of year – the length of daylight can affect egg production. 4. Changes in the type of food given – this may cause problems as the nutritional content of the food may vary. 5. The introduction of new birds to the flock – this may cause undue stress for the duckss as they re-establish a pecking order. 6. Significant changes in routine – can cause stress for the birds. 7. Housing conditions – unclean, overcrowded, dark and cold conditions can cause stress and or illness which may affect egg production. 8. Handling and movement of the birds – transporting ducks, overhandling, incorrect handling and sudden handling may hinder laying if this causes stress for the birds. 9. Vermin and predators – the presence of rats, mice, cats, dogs and foxes may frighten the birds or cause undue stress. 10. Become broody – the duck stops laying because she wants to sit on a nest of eggs and hatch them . Hope this helps and hope that your ducks starts laying again soon.